Sam Wear and eSpatially New York features JL Cartography! Check it out: eSpatiallyespatiallynewyork.com/2017/02/09/jonathan-levy-cartography-remixed! For those that don't know, I was a total jazzhead throughout high school, college and when I first moved to NYC. I am forever indebted to my father, Stan Levy, who, himself is a tenor saxophonist, was constantly playing jazz records growing up. 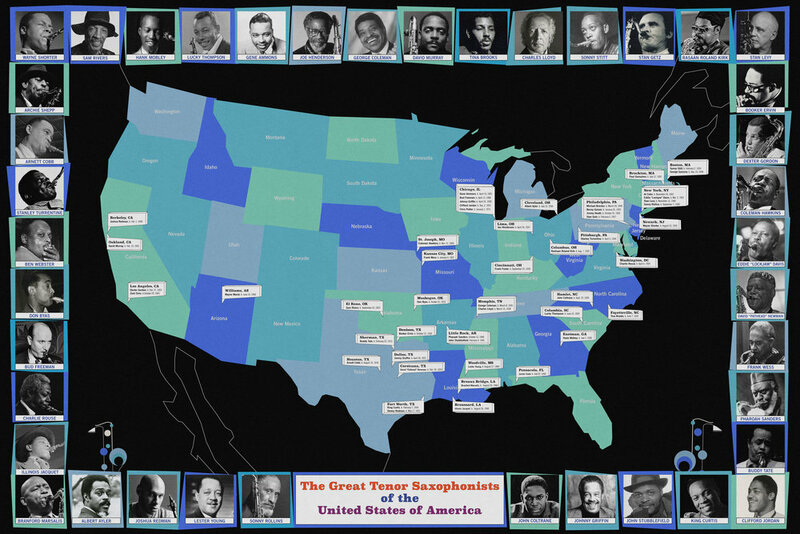 I compiled some of the greatest tenor saxophonists born in the United States through a map. I took into consideration birthplace/dates and you are able to see the distribution here. A fun discovery of this process was discovering the great "Texas Tenor" tradition (NPR article). This print map certainly warrants an interactive piece so that may be around the corner! For the design style, I borrowed from the venerable jazz labels of the past with their own particular sophisticated design aesthetic, namely Prestige Records, Blue Note, Savoy and Impulse. Environs Map Series and more featured in "Cartographics: Designing the Modern Map"
Conversation about maps, music, and comedy as I join comedian Myq Kaplan on his always entertaining podcast, "Hang Out with Me". I attended the Ebola Open Data Jam last week and was able to help out the Ebola stricken areas in their relief efforts by drawing in buildings, roads, and infrastructure on the Open Street Map where it is missing. Open Street Map is a citizen run community of mappers from all over the world populating and open source map with data. It is actively being used by the American Red Cross and others on the ground in West Africa. I'm pretty sure anyone with just a modicum of technical know-how can contribute, not just professionals. and I strongly encourage folks to check this out. 4. Make sure you follow your tasks instructions closely. Excited to be teaching a workshop on GIS and Mobile Applications at the Pratt Institute's new Certificate Program in GIS and Design.